Of all the lies Ferdinand Marcos propagated, the most interesting one has got to be his Tasaday hoax. I say “interesting” because it is unlike most martial law stories of unconscionable torture and murder; we can be interested in it without feeling ignorant, remorseful, or angry. Marcos’ fabrication of a Stone Age tribe is seemingly harmless beside his plunder and slaughter, so we end up glossing over it and forgetting that it ever happened. But like other stories from that dark period of our history, the Tasaday episode is worth examining if we wish to understand how truly despicable Marcos’ rule was. I stumbled upon the first extensive article in National Geographic magazine on the Tasaday, published August, 1972, a month before martial law was declared. In those 20 months leading to martial law, there was grave political and economic unrest: gas prices soared worldwide; the peso crashed from P3.90 to the US dollar in 1969 to P5.5 to $1 in January 1970 due to the net deficit (i.e., mismanaged debt) of the Marcos government in 1969, standing three times larger than in the previous year and roughly equal to the cumulative deficits between 1961 and 1969; the average income of the richest families ballooned to 15 times more than that of the poorest; and nearly half of the family population (16 million) was unable to satisfy minimum food needs. Marcos needed to take the heat off him, so he decided to rally Filipinos against the Malaysians instead. His administration set out to win back Sabah. But in order to do that, they felt that they needed to prove that prehistoric Filipinos existed. 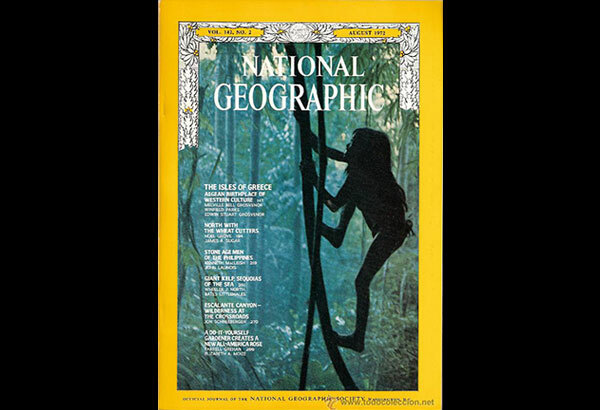 And, as though on cue, the Tasaday sprouted out of nowhere, “discovered” by one of his cronies, Manuel “Manda” Elizalde, Jr.
Worldwide curiosity: A Tasaday child, named Lobo, hanging onto trees; one of the few times the Philippines landed on the cover of the National Geographic magazine. Mando Elizalde was the appointed Secretary of the Presidential Arm for National Minorities (PANAMIN). He had been hailed the hero of indigenous peoples ever since his appearance in an article for National Geographic magazine, entitled “Help for Philippine Tribes in Trouble” in August 1971. He was depicted as the savior for the Lumad, rugged, “young, wealthy, and Harvard-educated,” who, with Marcos’ blessing, helicopters down into their villages (with a Vietnam War veteran as his pilot, no less) as he stops loggers from ever entering their land. Beat that, Captain Planet. In the 27-page article about the Tasaday, entitled “Stone Age Cavemen of Mindanao,” Manda Elizalde was known to the Tasaday as Momo Dakel Diwata Tasaday, or Great Bringer of Good Fortune. In it Balayem, a representative from the Tasaday, was quoted as saying, “Our ancestors told us never to leave this place of ours. They told us the god of our people would come if we remained here. Their words have been proven true by the coming of Momo Dakel Diwata Tasaday.”Mahayag, also a Tasaday, continued by saying, “If we had not met Momo Dakel Diwata Tasaday, we would probably have died in darkness without seeing the prophecy of our ancestors come true. We can see how he loves us. He has eyes and ears with us now.” Of course, President Marcos was duly credited as the one with the power to give them their lands. Kenneth MacLeish, senior assistant editor for National Geographic magazine at the time, wrote with fascination about the Tasaday. He was stunned the moment he entered their cave, let his guard down, and immediately viewed the Tasaday as mankind’s last remnants from the Stone Age. He swallowed their story without thinking twice and wrote a sensational account of men who called their helicopter “a big bird,” a tribe who had “no words for numbers,” refused meat and hunting bows because they had “no need for it,” scattered their dead around the mountains, had no agricultural implements, and no leader all at the same time. MacLeish dubbed them as “perhaps the simplest of living humans… closest to nature… gentle and affectionate.” He even narrated an instance when a Tasaday attempted to build fire by placing tinder over his flashlight’s lens. The National Geographic Society also filmed them; the documentary was shown repeatedly worldwide. Perhaps unknowingly, MacLeish and his organization became an accomplice to the Tasaday hoax. But it was Manda Elizalde, as well as the Marcos administration, who benefited most from the Tasaday story. They captivated the world’s imagination and a slew of visitors from here and abroad paid handsomely to visit and study the so-called “Stone Age tribe.” Momo Dakel Diwata Tasaday exclusively facilitated the excursions. But it didn’t take long for archeologists to smell a rat. When the Marcos administration was deposed by the People Power Revolution in February 1986, Elizalde no longer held control of visitations to the Tasaday. The authoritarian government’s filter on what researchers could and could not do on-site was removed. Swiss journalist Oswald Iten, accompanied by Joey Lozano, slipped into the area on March 1986 and spotted the Tasaday living in houses and wearing regular clothes. The following week, German magazine Stern sent their reporters who saw the Tasaday wearing leaves once more… but with cloth garments underneath. It caused worldwide curiosity and, with the tyrannous Marcos and the PANAMIN gone, the Tasaday’s ways were called into question. If they indeed foraged for food, how come they never migrated from their cave? Introduced to metal, how come they never sought it themselves? And most pressingly, what was up with the habitat/clothing shift (and shift back)? Soon, experts declared that the Tasaday was simply a fake, a ploy by the Marcos regime to revise history and gain sympathy when they needed it. The Tasadays were called con artists by the press, and their existence was wiped out of many history books. In Iten’s article, a Tasaday confessed, “We didn’t live in caves, only near them, until we met Elizalde. (He) forced us to live in the caves so that we’d be better cavemen. Before he came, we lived in huts on the other side of the mountain and we farmed. We took off our clothes because Elizalde told us to do so and promised if we looked poor that we would get assistance. He gave us money to pose as Tasaday and promised us security from counter-insurgency and tribal fighting.”When the initial shock receded early in the ‘90s, it was declared that the Tasaday were probably related to the Manobo of South Cotabato. And while it was true that they had a culture of their own (and were not simply acting), they — most definitely — had not been a tribe from the Paleolithic period. It remains widely accepted that their claim to fame was an outright lie. My cousin, practicing archeologist Anna Pineda, calls the Tasaday hoax “a cautionary tale for nationalism driven by the wrong reasons.” Kara David of GMA News visited the Tasaday in June 2009. In her short documentary, she showed how the Tasadays continued to live real lives, and that they cursed the day outsiders came. They now farm, live in nipa houses, remain poor and sparingly schooled, and they wholeheartedly believe that they are Tasaday. It became clear to me that the real culprit was not the Tasaday, but the ones who declared them relics of the Stone Age. The Tasadays were used, sent back in time, to support the belief that all power, all truth, and all that’s fair emanated from the great Ferdinand Emmanuel Edralin Marcos.